Hey there! Happy Wednesday and welcome back to another week of meal inspiration. 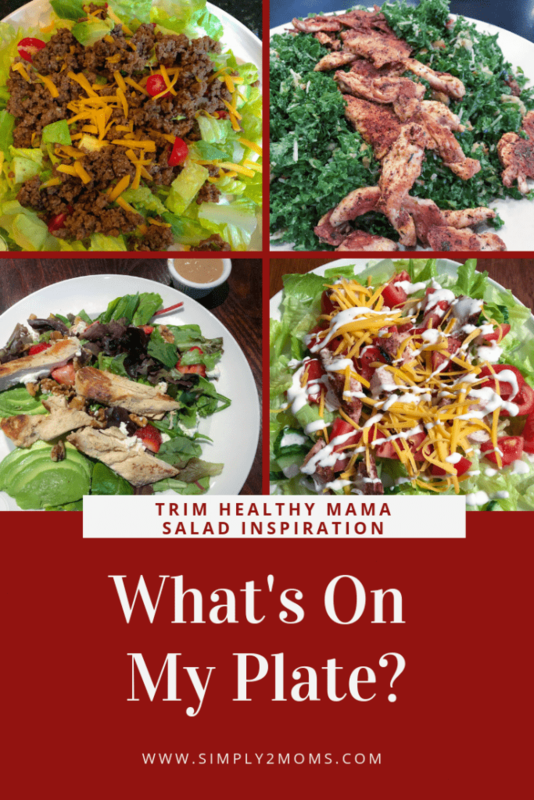 Both Anne & I follow the Trim Healthy Mama plan (THM) but even if you aren’t following this plan, you can find lots of ideas for healthy meals in our weekly series. You can read about how we found THM here and here. This time of year is always busy with parties, events, and just preparing for the holidays. It’s so easy to get off track with your healthy eating. Check out this post with 10 tips to stay on plan during the holidays. 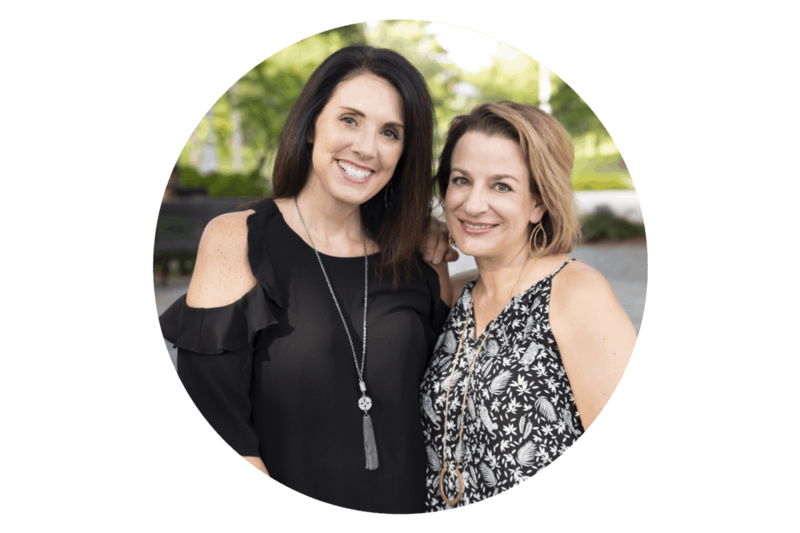 We usually share an entire day of meals in our What’s On My Plate series including breakfast, lunch, dinner and a snack. But today I thought I’d do something different and share 4 different salad options. 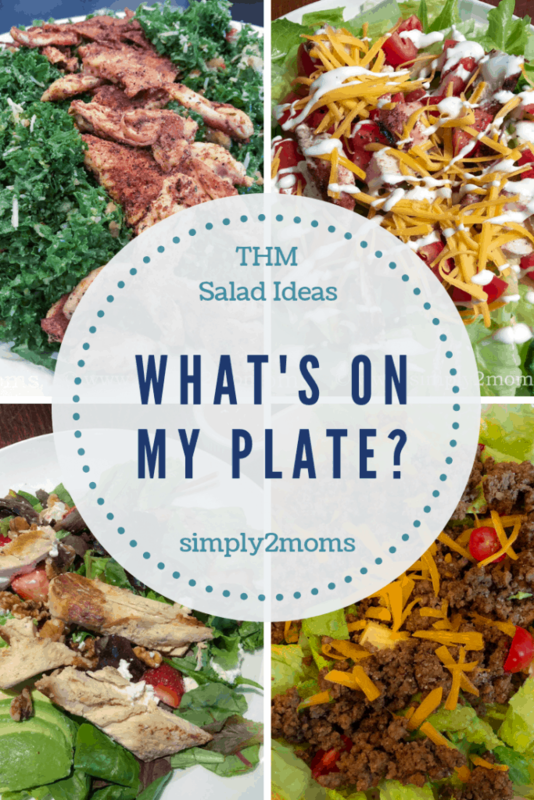 Salads are a quick easy meal to have at home, eating out or even on the go. My family loves tacos… both beef & chicken. When I make beef tacos I use 93% lean ground beef and then rinse after browning to remove excess fat. The kids enjoy their tacos with all the toppings in a taco shell or tortilla. But my husband and I gave up the shells for a crisp bed of romaine lettuce (before the recall…when are we going to get our romaine back!?). And with all those yummy toppings: tomatoes, avocado, shredded cheddar, I never feel like I’m depriving myself. I often put our family meals over a bed of lettuce. 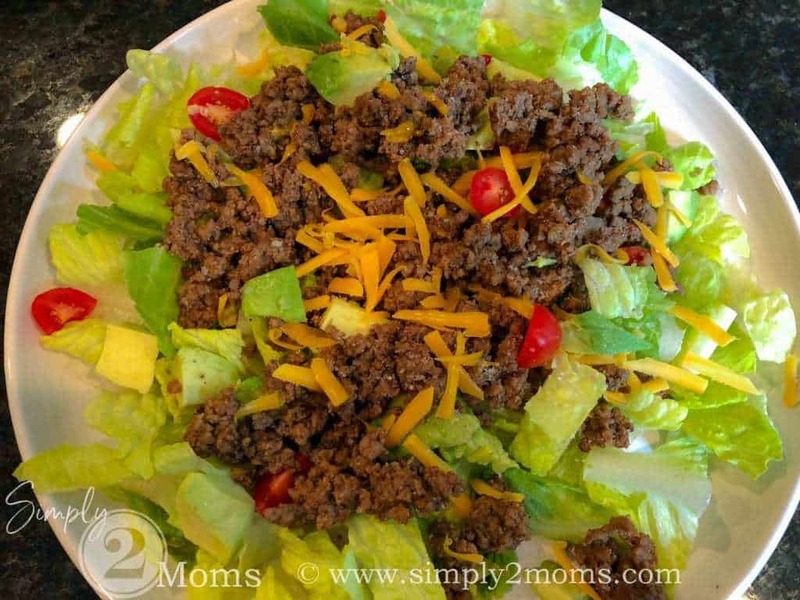 If we are having burgers…I add my burger to a salad. I do the same with grilled chicken. While the kids had a baked potato and side salad with their grilled chicken. 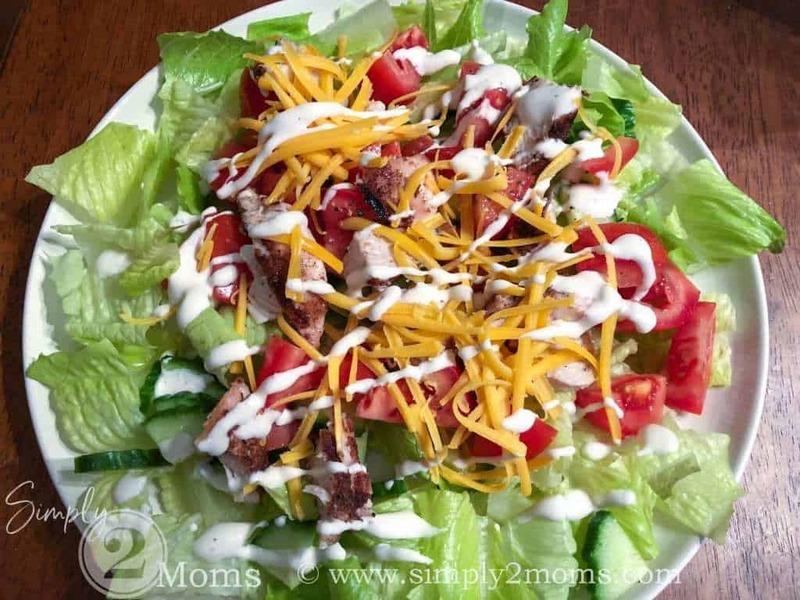 Chris and I made grilled chicken salads for our meal with romaine lettuce, english cucumbers, tomatoes, shredded cheddar and ranch dressing. Yum! Salads are super easy to order when you are eating out. Just be sure to omit any candied nuts and ask your server about sugar in the dressing. This California salad from one of my favorite restaurants Famous Toastery is so good. 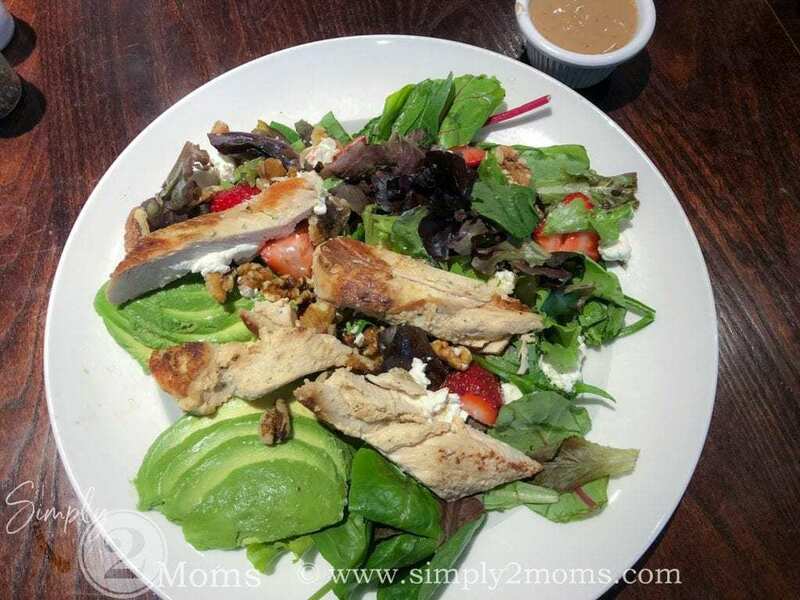 Mixed greens, avocado, goat cheese, walnuts, strawberries and grilled chicken. 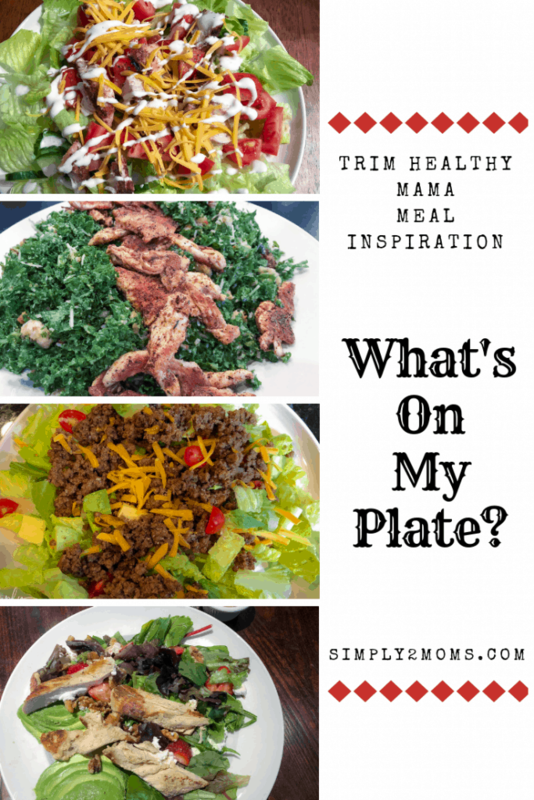 Remember the menu is just a guide…don’t be afraid to change some things on your salad. This salad is served with a raspberry vingerette but since I don’t eat sugar I changed it to balsamic dressing. It also comes with oranges, which I asked the server not to include so that I kept this an S meal with very low carbs. Another great local resturant is Fresh Chef Kitchen. If I’m being totally honest… I didn’t think I liked kale… it just seemed too… I don’t know pointy. Haha! But one day while I was having a chicken caesar salad Anne got me to try some of her kale salad. One bite and I loved it! 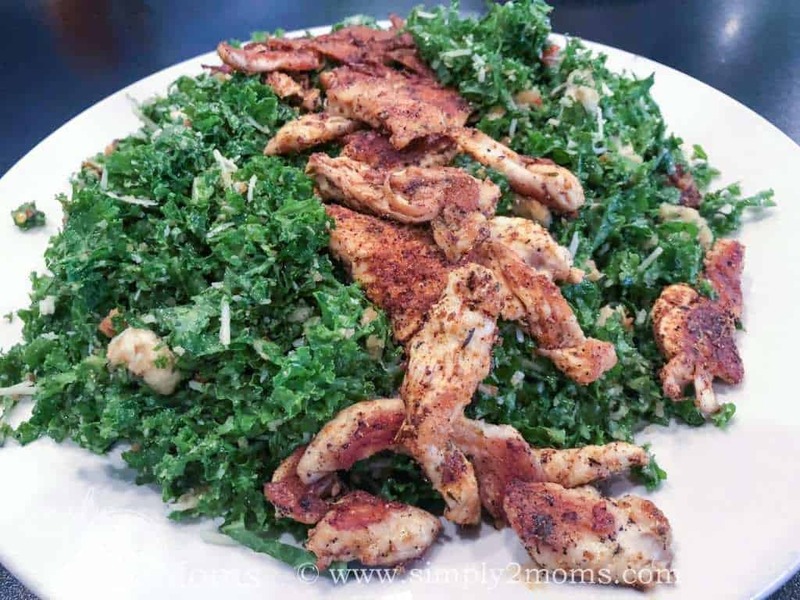 Anne even recreated this delicious kale salad with her own recipe, so if you aren’t local you can enjoy this superfood at home. I add blackened chicken to my kale salad but Anne always has salmon on hers. I know salmon is good for you but I just can’t do it, so I’ll stick to the healthy kale! I hope you take time for yourself during this busy time of year. Enjoy a healthy salad at home, or meet a friend for lunch or even grab a salad to go during work. Here’s to staying on plan this holiday season!